"Classical era" redirects here. For the Classical period in music, see Classical period (music). For the classics journal, see Classical Antiquity (journal) and Classical World (journal). Conventionally, it is taken to begin with the earliest-recorded Epic Greek poetry of Homer (8th–7th century BC), and continues through the emergence of Christianity and the fall of the Western Roman Empire (5th century AD). It ends with the dissolution of classical culture at the close of Late Antiquity (300–600), blending into the Early Middle Ages (600–1000). Such a wide sampling of history and territory covers many disparate cultures and periods. Classical antiquity may refer also to an idealised vision among later people of what was, in Edgar Allan Poe's words, "the glory that was Greece, and the grandeur that was Rome". The Phoenicians originally expanded from Canaan ports, by the 8th century dominating trade in the Mediterranean. Carthage was founded in 814 BC, and the Carthaginians by 700 BC had firmly established strongholds in Sicily, Italy and Sardinia, which created conflicts of interest with Etruria. A stela found in Kition, Cyprus commemorates the victory of king Sargon II in 709 BC over the seven kings of the island, marking an important step in the emancipation of Cyprus from Tyrian rule by the Assyrian military. 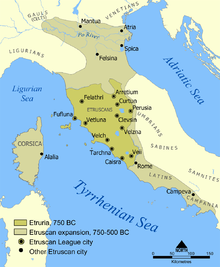 Etruscan civilization in north of Italy, 800 BC. 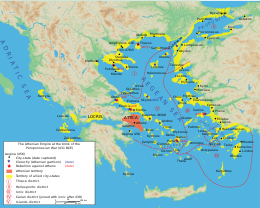 Classical Greece entered the Hellenistic period with the rise of Macedon and the conquests of Alexander the Great. Greek became the lingua franca far beyond Greece itself, and Hellenistic culture interacted with the cultures of Persia, Kingdom of Israel and Kingdom of Judah, Central Asia and Egypt. Significant advances were made in the sciences (geography, astronomy, mathematics etc. ), notably with the followers of Aristotle (Aristotelianism). While sometimes compared with classical Greece,[by whom?] classical Rome had vast differences within their family life. Fathers had great power over their children, and husbands over their wives, and these acts were commonly compared with slave-owners and slaves. In fact the word family, "famiglia" in Italian, actually referred to those who were under authority of a male head of household. This included non-related members such as slaves and servants. In marriage, both man and woman were loyal to one another and shared property. Divorce was first allowed starting in the first century BC and could be done by either man or woman. 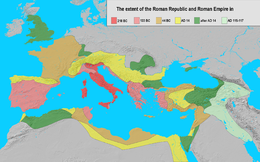 In politics, the late Roman conception of the Empire as a universal state, headed by one supreme divinely-appointed ruler, united with Christianity as a universal religion likewise headed by a supreme patriarch, proved very influential, even after the disappearance of imperial authority in the west. 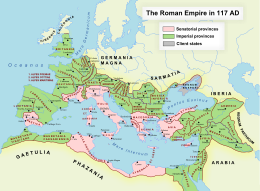 This tendency reached its peak when Charlemagne was crowned "Roman Emperor" in the year 800, an act which led to the formation of the Holy Roman Empire. The notion that an emperor is a monarch who outranks a mere king dates from this period. In this political ideal, there would always be a Roman Empire, a state whose jurisdiction extended to the entire civilized world. "the glory that was Greece, the grandeur that was Rome!" In the 18th and 19th centuries AD, reverence for classical antiquity was much greater in Europe and the United States than it is today. Respect for the ancients of Greece and Rome affected politics, philosophy, sculpture, literature, theatre, education, and even architecture and sexuality. Epic poetry in Latin continued to be written and circulated well into the 19th century. John Milton and even Arthur Rimbaud received their first poetic educations in Latin. Genres like epic poetry, pastoral verse, and the endless use of characters and themes from Greek mythology left a deep mark on Western literature. In architecture, there have been several Greek Revivals, which seem more inspired in retrospect by Roman architecture than Greek. Washington, DC is filled with large marble buildings with facades made out to look like Roman temples, with columns constructed in the classical orders of architecture. ^ Yon, M., Malbran-Labat, F. 1995: “La stèle de Sargon II à Chypre”, in A. Caubet (ed. ), Khorsabad, le palais de Sargon II, roi d’Assyrie, Paris, 159-179. ^ Radner, K. 2010: “The Stele of Sargon II of Assyria at Kition: A focus for an emerging Cypriot identity?”, in R. Rollinger, B. Gufler, M. Lang, I. Madreiter (eds), Interkulturalität in der Alten Welt: Vorderasien, Hellas, Ägypten und die vielfältigen Ebenen des Kontakts, Wiesbaden, 429-449. ^ "The Cypriot rulers as client kings of the Assyrian empire". The many kingdoms of Cyprus. 5 Nov 2012. Retrieved 21 January 2016. ^ Adkins, Lesley; Adkins, Roy (1998). Handbook to Life in Ancient Rome. New York: Oxford University Press. p. 3. ISBN 9780195123326. ^ Myths and Legends – Rome, the Wolf, and Mars Archived 2007-05-29 at the Wayback Machine. Accessed 2007-3-8. ^ Matyszak, Philip (2003). Chronicle of the Roman Republic: The Rulers of Ancient Rome from Romulus to Augustus. Thames & Hudson. p. 19. ISBN 9780500051214. ^ The precise event which signaled the transition of the Roman Republic into the Roman Empire is a matter of interpretation. Historians have proposed the appointment of Julius Caesar as perpetual dictator (44 BC), the Battle of Actium (September 2, 31 BC), and the Roman Senate's grant of Octavian's extraordinary powers under the first settlement (January 16, 27 BC), as candidates for the defining pivotal event. ^ Wiesner-Hanks, Merry E. Gender in History Global Perspectives (2nd ed.). Wiley-Blackwell. ISBN 978-1-4051-8995-8. ^ Hadas, Moses (1950). A History of Greek Literature. Columbia University Press. p. 273 of 331. ISBN 0-231-01767-7. ^ a b Henri Pirenne (1937). Mohammed and Charlemagne Archived 2015-04-08 at the Wayback Machine English translation by Bernard Miall, 1939. From Internet Archive. The thesis was originally laid out in an article published in Revue Belge de Philologie et d'Histoire 1 (1922), pp. 77-86.